NOTE: Old post, a little rambly. There’s a scene towards the end of Psycho-Pass in which our protagonists, Akane Tsunemori and Shinya Kougami, have cornered the villain of this story, Shougo Makishima, and are going after him. The Sibyl System which controls their society judges Makishima to be mentally well-adjusted in spite of his heinous crimes, due to a rare case of psychological apathy. Kougami has planned to kill Makishima, but Akane objects to this as it is part of her duty to the Sibyl System to keep Makishima alive. Kougami asks her why it is that she continues to follow Sibyl in spite of its inability to protect the people. Akane replies simply “the law doesn’t protect people, people protect the law”. Indeed, the Sibyl System may be a morally divisive and blatantly corrupt system, but as long as it maintains order in people’s lives many see it as a good thing not to try and overthrow it. That is, except for people like Kougami and Makishima. 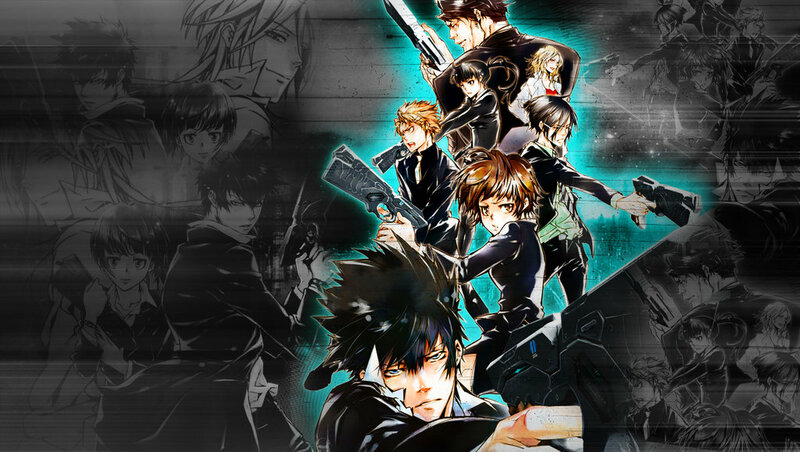 Psycho-Pass, like a whole lot of dystopian fiction, is an allegory for the inevitable and seemingly never-ending cycle of corruption in all societies, except that it may be one of the most powerful and thoughtful executions of such a concept because it’s open-ended rather than outright rebellious. The setting is 100 years in the future, within a now isolated Japan that functions under the aforementioned Sibyl System – a form of crime control that psychologically analyses the citizens to decide what is ideal for them to live the life that is safest for them and their society. Of course, being dystopian fiction, there’s some issues within that society. It gives its citizens happiness and safety, but not freedom. This is handled by Gen Urobuchi, perhaps most well-known for Puella Magi Madoka Magica, a writer notorious for his deep obsession with moral ambiguity and strong focus on philosophy. Dystopian fiction is perhaps the most ideal form in which Urobuchi can express themes of morality, and as a result Psycho-Pass is his most potent work in that regard. There’s a lot of going around in circles here in Psycho-Pass. The final scene is almost identical to the very first scene – a new Inspector joins the Public Safety Bureau and their sent to work on a difficult situation on their very first day due to a shortage of manpower. The final scene is almost frame-for-frame, word-for-word and gesture-for-gesture identical to the beginning scene. Akane probably realises this, but she continues on realising that as a member of the Public Safety Bureau she has to uphold their values even if they don’t coincide with her own. Akane is, to me, the character with the most ideal philosophy. Sibyl is undoubtedly in the broader scheme of things an ideal system, but it’s one totally lacking in understanding of the individuals that make up such a society. Akane accepts the corruption of her society, and though she disagrees with it she’s willing to fight for it for the sake of creating peace. That’s why the Sibyl System trusts her. Another character, Nobuchika Ginoza, says to Akane early on that “the wise learn from history, fools learn from their mistakes”. In that case Ginoza himself is a fool. Due to his own humanity he ends up somewhat tragically following in the footsteps of his father, Tomomi Masaoka and being judged by Sibyl as being unstable, resulting in a demotion to Enforcer. He accepts this, and he accepts his relation to his father once he does by taking off the glasses he used to obscure his relation to him. Yet another character who goes around in circles, who ultimately has to come to terms with the unfortunate cycle of life. The relationship between father and son was the most moving subplot in the series for me, poignant to the extent that it brought a few tears to my eyes at its emotional climax in episode 21. Urobuchi knows so well how to tie his themes to an emotional attachment with the characters of his narrative, and it makes his works feel that much closer. One of the biggest parts of what makes Psycho-Pass such a profound dystopian work is its attention to detail. Its character designs by Akira Amano were designed to be quite vividly real and relatable while also aesthetically pleasing, and at times such an aesthetic has a real visceral resonance that helps such a series. Director Katsuyuki Motohiro makes use of clean-cut but fine-tuned and effective directing techniques, such as making quick transitions through brief cuts to black. The narrative also has a strong attention to detail, and establishes in great detail the turmoil under the surface that’s been ongoing with the Sibyl System. Masaoka, being from the old society, is a victim to psychological effects of the new level of control in such a society. We see people come from many different perspectives with many different outlooks and reactions to it. We learn that art is under a great deal of control due to the system, and many musicians, painters, critics and other creators and observers of art have become disillusioned due to the scrutiny they face in a society that deems their philosophies useless, and we also learn of the ongoing attempts at rebellion that the Public Safety Bureau has to keep under control. Among those rebellions, the most dangerous is perhaps the previously mentioned antagonist, Shougo Makishima. As also previously mentioned, Makishima is an anomaly. He doesn’t have the psychology of a normal person and doesn’t view certain actions in the same ways other would. Due to that he’s isolated from the Sibyl System. Makishima is almost childlike in a sadistic way. He incessantly and mockingly quotes the philosophies that came from the society that we live in. His loneliness leads to him playing around with people who have the free will to question the system, as a means of creating chaos and as a means of getting society to view things as he does. Makishima is unsuccessful, but he does manage to create some significant damage, the most significant within this narrative being his effect on Kougami. Kougami is a cold and reserved character with the single obsession of killing Makishima due to Makishima essentially ruining his life. Him and Makishima are said to be very alike, both morally autonomous individuals, but the difference between them is that Kougami has concern for others. Despite this the similarities between Kougami and Makishima eventually lead to Kougami betraying his concern for others, satisfying his own overwhelming obsession and isolating himself from society. Most certainly that’s a selfish, hateful act by Kougami, but not too far out from the ideals that have lead us to where society is today. I have one nagging gripe from Psycho-Pass despite my love and adoration for its wonderfully sophisticated messages and its thematic and emotional power, and that involves a few of the earlier episodes and their occasional tendency to tread on vapid crime thriller territory. One of those scenes is in episode 10, in which Kougami, caught in a game set up by Makishima along with a friend of Akane’s named Yuki Funahara, has to look for an antenna to communicate with his colleagues. He eventually finds it in Funahara’s bra, after asking her to take her clothes off and becoming suspicious once he realised she wasn’t wearing matching underwear. This was a very awkward scene that detracted from the focus of the narrative for a meaningless detective scenario, almost an outright immersion breaker. Thankfully the Crime Thriller aspect ties in neatly in the long run with the series conceptually and scenes like that become small pickings relative to the broader value I find in Psycho-Pass. Many may find it to be heavy-handed philosophically, but I believe that’s what makes Psycho-Pass. Its philosophical emphasis drives it so far with such focus that only a truly strong work of art can do. Psycho-Pass is without a doubt one of the richest works that Gen Urobuchi has ever created, and a hallmark of quality in an artistically flailing industry.